This is the last recipe I prepped for the blog this week before baby. I feel like I should light a candle and break out into ballad. “Total Eclipse of the Heart,” anyone? It’s my favorite. Can I be honest about something? I’m ready for a break. As much as I love (LOVE LOVE) what I do, I’m ready to take a step back for a bit from the kitchen to enjoy other parts of my life — like being a mom for the first time. I’m ready to take some time to refocus my energies here so that, when I’m ready to be back in the kitchen, I can make the yummiest of yums for you guys. Because you are here and I am so grateful and you deserve only the yummiest of yums. But for now, break time. Time to be a mama. Oy, that’s a little terrifying to write. 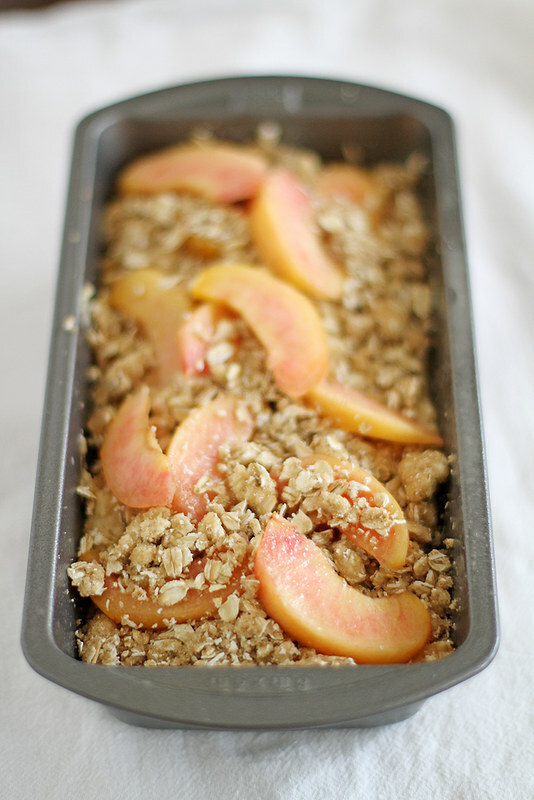 This peaches and cream streusel bread was the perfect recipe to end my preparatory baking/cooking binge (a.k.a. nesting, a.k.a. my house has never been so clean nor my pantry/fridge/freezer so well organized! It’s amazing! It’ll last for maybe a week!). It comes straight from my new eCookbook, “Quick Bread Love” (if you don’t have a copy yet, get thee one! ), and it truly is my favorite recipe from the book. Can I say that? Is that like choosing a favorite child? I don’t know these rules yet. But really, just look at this beaut. Look at all those glorious pieces of fresh peaches studded throughout the loaf. Look at that dense, soft and tender crumb. Look at that buttery, spiced streusel topping. It’s just such a show-off of a bread, but rightfully so I think. It’s just sweet enough, just tangy enough, just spiced enough — and I just can’t get enough of it. Proof: The half-eaten loaf in my fridge. And I made it yesterday afternoon. It’s also made with ingredients you probably have in your house right now or can easily get from the grocery store (as are all the recipes in the eBook), so basically I’ve left you with no more excuses not to bake this immediately. Now if you’ll excuse me, I’m going to put my feet up, enjoy what is probably the fourth slice of the day of this delicious loaf and prepare my vocal chords for “Total Eclipse of the Heart.” Yeah that’s still happening. P.S. I hope this post doesn’t make it sound like I’m not going to be present on the blog during my leave — I will still be here, don’t you worry! Things just might be a little quieter in general. Well, here anyway — my home life might be a little louder/more chaotic/filled with diapers. Or so they tell me. P.P.S. You have two chances to win a copy of the full “Quick Bread Love” eCookbook package this week! Head over to A Kitchen Addiction and Eat Your Heart Out to enter, woo! Heat oven to 350°F. Lightly grease the bottom and sides of an 8-by-4-inch loaf pan. In a small bowl, combine rolled oats, brown sugar, cardamom and cinnamon. Cut in cold butter with a pastry cutter or fork until mixture resembles coarse crumbs. Place bowl in fridge while you prepare the bread. In a large bowl, whisk sour cream, brown sugar, oil, vanilla and egg until smooth. In a separate large bowl or bowl of a stand mixer fitted with the paddle attachment, stir together flour, baking powder, baking soda, salt and cinnamon. Add sour cream mixture to flour mixture; stir until just combined. 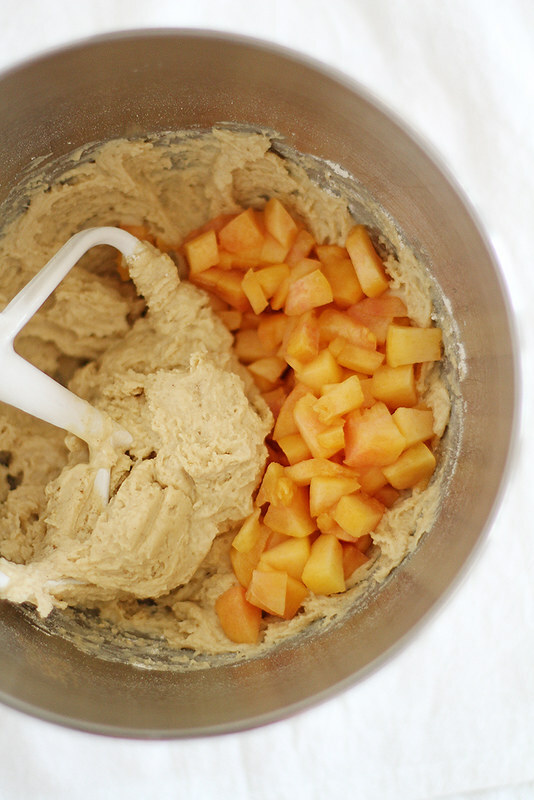 Fold in diced peaches. Pour batter into prepared loaf pan. Top with sliced peaches and streusel. Bake 50 minutes to 1 hour until a toothpick inserted in the center comes out clean. Tent loaf with foil halfway through baking if peaches are drying out too much or top is browning too quickly. Cool bread 10 minutes in pan, then carefully remove from pan. Transfer to a cooling rack to cool completely. This bread was one of my favorites from the ebook and can’t wait to try. Have a great time on the break. It’s so exciting!! Can’t wait to ‘meet’ her. Oh gosh!! This is so perfect for these warmer days. Making me feel like summer is on the way!!! Wishing you all the best before the arrival (and after, haha) of baby dough!! Love this bread! Oh Yum I love the strudel recipe in your Ebook; it perfect! Good luck for your delivery. Oh my gosh! Baby in a few days?? How did that happen? This is so exciting and I cannot wait to see photos! Yes to streusel. Always, always yes to streusel. This bread has my name all over it! Zainab — Thanks, dear! I can’t wait to meet her, either. 🙂 I hope you love the bread! Steph — It’s the only bit of summer we have here, ha, but I’ll take it! Thanks! Marie — Thank you, friend! Belinda — Thank you dear! Kathryn — I can hardly believe it myself. 🙂 Thanks, dear — hopefully I’ll have pics to share very soon! Tieghan — Right? In some ways it went by so fast! This bread looks really really beautiful! I will totally Total Eclipse with you any dern day 😉 I’m so PSYCHED for you and your new family, and I hope you enjoy your few weeks away. Can’t wait to see what other bloggers are lined up for your guest posts. And this bread?? Millions of peaches, peaches for me….UGH I want to sing it every song ever!! This looks incredible! I was looking for just this, because I (rather oddly) received a giant box of peaches. Also: you’re going to be a MOM! That’s amazing, and so, so exciting for you 🙂 enjoy every moment! This looks beyond delicious!! I’m SO eager for ripe summer-time fruit to arrive. Good luck with the new babe’s arrival (the nursery looks fantastic!)! So excited for you! Enjoy your time off with your little girl, I hope we can look forward to pictures on Instagram?? 🙂 Good luck!!!!! Stephanie, you’ve been a machine these past few months so you definitely deserve to focus now on you, your new baby and your family. This is such an exciting new chapter of your life. I can’t wait to see photos of your sweet little one and hear all about it, but until you’re ready to get back to blogging, take all the time you need! 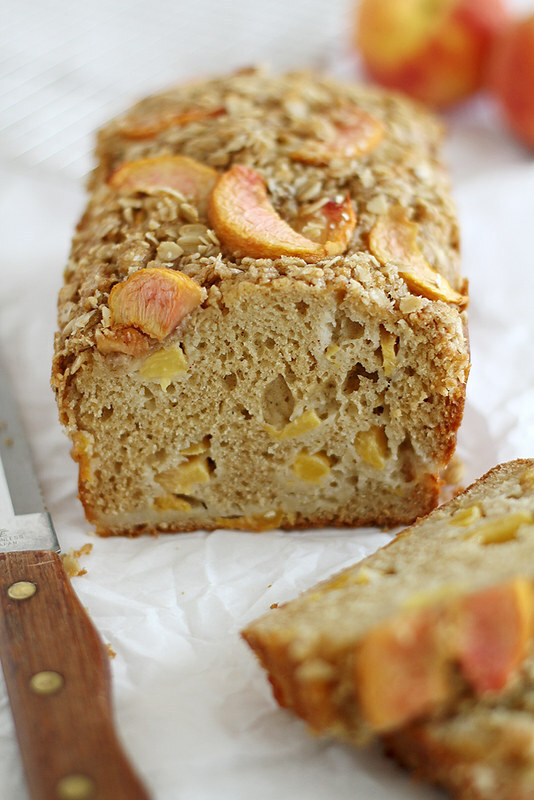 This gorgeous peaches ‘n cream bread is the perfect way to start your hiatus. These photos are gorgeous and the loaf looks incredible. Enjoy your break and being a mom! This bread looks divine. Fresh peaches and streusel what could be better? I need to get my hands on a copy of your book, quick breads are my favorite! Jocelyn — Thank you, my dear! CakePants — Thank you so much! Nicole — Thank you, dear 🙂 And yes, I will definitely post pics on the IG! So lovely. 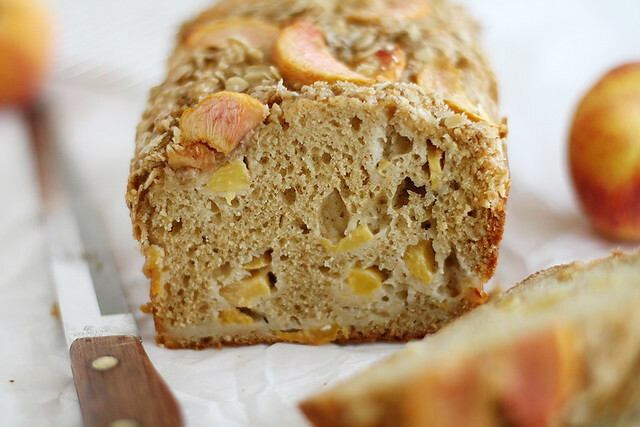 I adore peach bread. Yours is so pretty with the streusel (I love streusel!) and the peach slices on top. Best wishes. Can’t wait to meet your babe! This looks delish! I’m so excited for you and so excited for Avery’s arrival 🙂 I hope you’re getting some rest! This bread is next on my list to make! I am so excited for you!! I cannot wait to “meet” your precious baby girl! I completely understand needing a break and needing to refocus. Enjoy it! And the bread looks awesome. Yes please! Sign me up for this! Seriously, this looks way too good. With Louisiana peaches coming into season, I’ve got to make this. Pinning! Brenda — Thank you, friend! I’m excited to have her here (and eat more peach bread until then ;)). Teresa — Thanks, friend! Resting as much as I can (without going crazy ;)). Jessica — Yay! I hope you love it. 🙂 Thanks, dear! Megan — Thank you; I’m looking forward to being able to take the time to refocus! Graham — Yes! Use all the peaches. 🙂 Thanks! I’m so excited for you. New baby and a break. Enjoy every moment! 1. About the bread: YES! My hubby is obsessed with peaches and I always need things that he can pack in his lunches. LOVE IT. 2. So excited for you! Enjoy taking a step back, being a Mama (WHOA) and like you said, other parts of your life! Congrats girlfriend! Cant wait to see adorable baby pics cluttering up my Insta! 🙂 Pinned! This looks so yummy/ I love peaches. I might have to try it using whole wheat pastry flour and sucanat to make it more healthy. I try not to use much white flour. I want to see lots of pics of your little darling! How exciting! 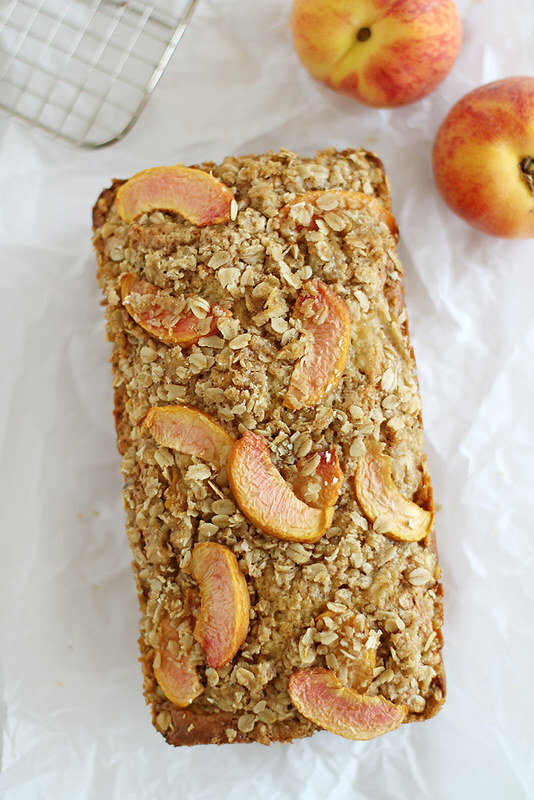 You deserve a break girlfriend….and I deserve a slice or 2 of this streusel bread. I can’t believe it’s so close! I’m so glad you’ll be able to take a little break, and have plenty of time for baby snuggles and diaper blowouts. One possibly more enjoyable than the other. But BABY SNUGGLES. YEEEES! 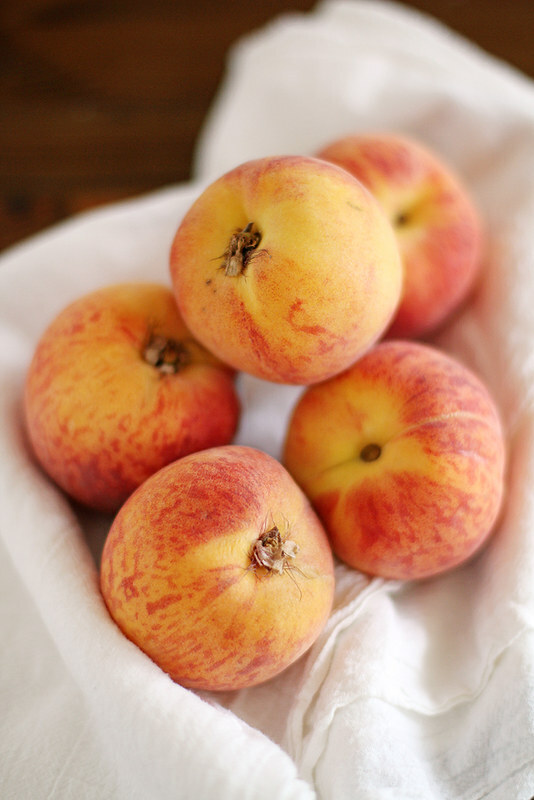 Goodness gracious you have me craving peaches so bad right now! Charlotte — Oooh yes, give it a try with those substitutes… and let me know how it turns out! Erika — Yes, yes you do. 🙂 And yes, I will definitely share pics! Val — Thank you so much! Mademoiselle Gourmande — Peaches and streusel are just meant to be, I think. 🙂 Thank you! Courtney — Yesssss, baby snuggles! I can’t wait (though I can def wait for those blowouts ;)). Thanks, friend! Isadora — Haha, that’s a pretty good indicator! 😉 Thanks so much! Cannot WAIT for baby Avery. Glad I have this bread to stare at until her face appears on my IG feed! This bread sounds AMAZING! I can’t wait until I get back home so I can start whipping up recipes from your book 🙂 congratulations again! I so can’t wait for this little lovely to arrive!! It’s going to be the best. Much like this bread. This streusel bread looks absolutely amazing! 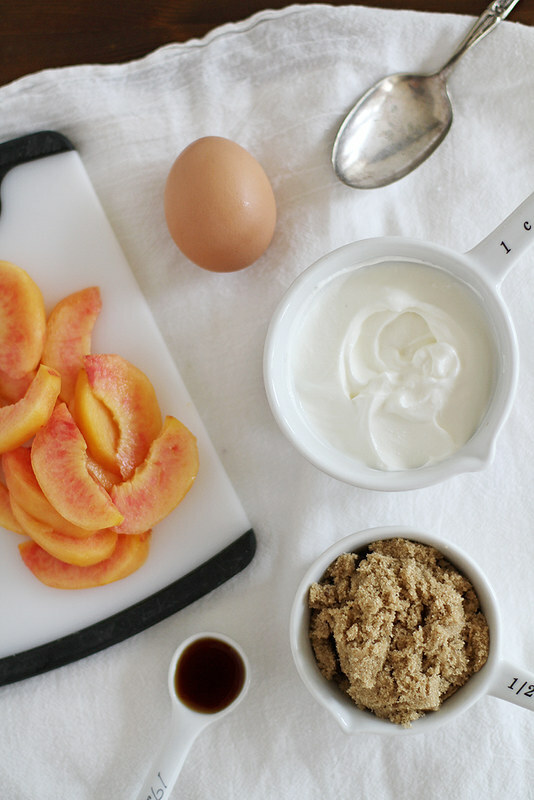 Pinning for now and am definitely going to make this when peaches are in season!!! YUM! Awe, this is such a sweet post. A break for such a blessing as a baby sounds amazing, congrats again and again!! What a delicious-looking bread! Enjoy your break and your new little one! Enjoy your break! This is such an exciting time in your life–you should totally just sit back and take it all in. Can’t wait to see her! I am getting so excited for you!! And I seriously can’t wait to make this bread! Whenever I see “peaches and cream,” I always start singing the 90s song in my head, which is weird, cus that’s not exactly the most appropriate song, but I can’t help it. Now I must make this bread and put on Total Eclipse of the Heart while I’m making it. It’s all your fault ; ) Can’t wait to see you in a few days! Does this need to be stored in the fridge? I saw that u said yours was in the fridge,but recipe doesn’t say that. Irma — I store mine in the fridge because I like to keep it cold simply as a taste preference, but it does not need to be refrigerated!